i've been working on scotch whiskeys lately. but in general i want to know about your experiences with any kind of non-beer related alcohol. do you like to slam jack or do you have some great home grown recipes with bitters and gin or other stuff i don't have any idea about. i grabbed a free magazine "Taste" from the liquor store the other day and it reminded me that LGP might have some great suggestions on mixed drinks using liquors i've never thought about. or in depth discussions on brands and values. including wine which i've only heavily dabbled in. i've tried these scotches in the last few months: macallan 12, laphroaig 10, chivas regal 12, tullamore dew 12, jameson 12, dalmore 12, glenfiddich 15, knob creek 9 (i think), highland park 12, bushmills, crown royal black, famous grouse. i was surprised at laphroaig's huge taste and have settled in on chivas 12 at this point. i know i'm doing it wrong mixing these with diet cola, but i really don't care. they still have an obviously different taste that i highly prefer now. i convinced myself to buy some higher priced drinks after spending a few months enjoying all kinds of very cheap brandy, but now i can't go back. i enjoy freezing these scotches and pouring them over ice. what else is out there for me to experience? what do you prefer? You have to experiment with wine to figure out what you like. Do it with cheaper wines to find out the kind wine you like (ie pinot grigio vs merlot vs reissling). Then you can test brands. There are a ton of studies to show that "good" win vs "bad" wine is all in your head, so don't think you have to buy a $40 bottle of wine. I rarely spend over $8 per bottle and really like the Barefoot wines, which are usually under $6 per bottle. I have been living on Tequila Sunrises lately...very easy to make and pack a punch.....Also very big into old-fashioneds, too, but only get them when I'm out. Wine: love it but have no knowledge so I'm buying cheap stuff like bhaw said and seeing what I have a taste for. I love love love love wine. It is the perfect accompaniment to just about everything this world has to offer, and yet it itself can never be perfected. For the past couple years, I've been fascinated with Spanish Albariños and Tempranillos. Styles of production, of course, vary from maker to maker. But I'm convinced that, as a baseline, those two varietals produce the most food-friendly wines on the planet. As an avid cook, that's important to me. Every year for the past five years we've gone on a wine tasting weekend excursion with some of Mrs Tif's ex-coworkers. This year we're back up in Sonoma (after a quick sojurn to Santa Barbara lat year), but we're going in July, a full two moths earlier than we've ever gone before. The grapes will be nice and fruity and plentiful, but it's also going to he hot. Hopefully the mimosas will be flowing on the bus. blackjack68 wrote: Good, aged dark rums. We are now BFFs. No dispute. I'm an Appleton guy, myself. Just finished off a bottle of the V/X last night. That's about the highest grade rum I'll mix with Coke. I've had the Reserve, the 12-Year and even the 21-Year.... and all make me happy. In terms of an 'everyday rum' (which might be my new favorite phrase ever), I prefer the V/X, but will often go with Mount Gay from Barbados. One of the reasons I'm partial to Appleton stems from a Halloween party about 8 years ago. I was "Cap'n Tif" the pirate, and I took an empty V/X bottle with me to a party and asked to host to use it to make me a rum and Coke............ which she did, using the full volume of the bottle, about 95% of which was a mix about six or seven rums. I drank the whole thing, and there are pictures of me throughout the night where the bottle is less and less full, and I'm getting progressively more..... affected. The final shot of my, there's like 1/4" of liquid in the bottle and I can only open one eye. Which was actually quite useful for the pirate get up, but rather a hindrance for making time with my super hot date (who I eventually married). I also really like cachaça (a Brazilian spirit that is a distillate sugar cane), especially if it's in a caipirinha, which - despite the above rhapsodizing - is my favorite cocktail. I was going to mention the Caipirinha. Love a well made one but have had some from a bartender that didn't know what he was doing. 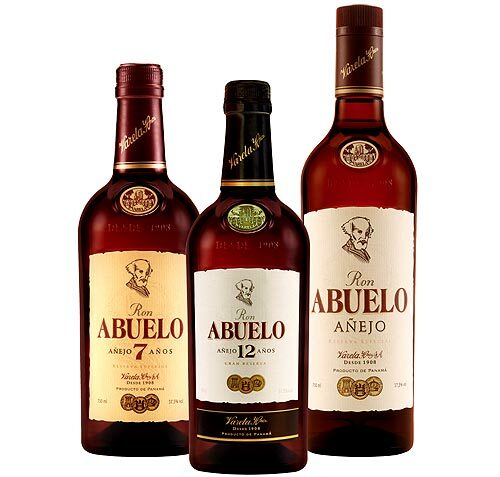 See if you can find an Abuelo 7 anos or 12 anos from Panama. I got a few bottles of the 7 year at the airport (Panama) for $12 each and then had to order the 7 year for $21 from a local store. A friend brought back a bottle of the 12 year. Drink that over ice with one lime wedge. Good stuff! I don't drink a ton of liquor... however, there are 2 exceptions: margaritas and Jagermeister. I guess there is a third... the official beverage of our OBX trips is the Jack Frost. There's good value in south american wine. Wines from chile and Argentina are really good and don't cost a lot. For liquor, I drink gin (tanquery) and club soda with lime wedges. Tonic is too sweet and has artificial ingredients. Club soda does the trick. Wine-The Seeker (Chardonnay), Chateau Greysac (Bordeaux), Tintara (Shiraz/Cab Sauv) have a case of Charles Shaw (Shiraz) around for everyday bottle. Been enjoying Spanish Reds lately. Got a great recipe for pomegranate Margheritas at a mexican cooking class, making it for a partay next week. Mostly vodka for me, with the occasional whiskey. My favorite every day (lol) vodka is Stoli which I will mix with pretty much anything. Red bull, Club soda, water, cranberry juice, pepsi, ginger ale, orange juice, tomato juice, etc etc etc you get the idea. My favorite vodka is stoli elit, which I drink straight, preferably with a couple of blue cheese stuffed olives, but I don't drink it very often considering they stopped carrying it in state stores, and when they did, it was >$50 a bottle. I like Jameson and Crown Royal for whiskeys, I find them both nice to shoot and to mix. Whiskey is the only liquor that I can really stand to both shoot and mix. No rum, gin very sparingly. Too many words. eddysnake wrote: Vodka-Firefly (been great these last few hot weeks). Firefly sweet tea vodka mixed in lemonade is super hero good. Bushmills Black Bush is my favorite whiskey. Also a big fan of Tullamore Dew 12, though the last time I had it, it was a bad, bad night for me. Not a big mixed drink person. Cosmos, bloody marys and margaritas are the only mixed drinks I drink. And rarely at that. In the summer I like the occassional chilled Limoncello. My family (in Italy) makes and markets a killer Limoncello. Have to special order it from the state store. I love red wines. Merlots, Pinot Noirs and Shirazs are my favorites right now. And thanks to the Chairman's Selects at the state store I can try a lot of different types of reds. Only white wine I drink is Pinot Grigio. No one mentioned gin yet? After I read Richard Marcinko's book Rogue Warrior I decided to try Bombay Sapphire. Marcinko was one of the very first Navy Seals and the founder/first captain of Team Six (there were only two teams at the time - he came up with Six to fool the Soviets). Anyway, while he was in Vietnam they'd go on demolition/sabotage missions during the day, go drink Bombay in a village somewhere, start a bar fight, and then go cheat on their wives. I'm lucky that a lot of my friends like gin too. When we get bottle service its almost always Bombay. Best is to drink straight with ice and lime. pittsoccer33 wrote: No one mentioned gin yet? I like Bombay and Beefeater. I prefer it with tonic, but it gives me a nasty hangover. I like my vodka straight though. One thing you have to remember with wine is that style of production is at least as equal if not more so than the grape varietal itself. Northern California - particularly the Arroyo-Seco region in Monterey, and the Russian River Valley in Sonoma - are know for producing incredibly rich, and oaky Chardonnay. Some of these wines are so structured and full that they can hold their own with a grilled ribeye. These are the wines that my wife loves the most. But I prefer Chardonnays that are a little more on the mineraly/acidic side - as I would, being primarily a food-oriented wine drinker - so I tend to prefer Chards from Napa, and Burgundy. Those aren't rules, of course; there's no guarantee that a Russian River Chard will taste like vanilla-scented butter. That's just what they're known for in that region. Our 'everyday' price point tends to be between $10 and $15 a bottle. You can find some incredibly delicious wines at this point - especially from Spain, Argentina and New Zealand - but you will need to pay close attention to your palate. Look up tasting notes for some of your favorite wines on online resources. Mark the common keywords ('good acid content', 'mineraly', 'tobacco', 'cherries', etc) and then look for wines made from other varietals and/or other regions that share one or two of those keywords. It's a fun way to start branching out. I feel sorry for you folks in PA, what with your State Stores and all, because shops like Total Wines and More, BevMo, Wine Styles, etc are fantastic resources for these kinds of viticultural scavenger hunts. Particularly Wine Styles, as they don't stock their shelves by varietal but rather by style. So you'll see a header that reads "Rich" and there might six or seven different types of wine under it, next to it is "Oaky" and there might six or seven other wines there. I wish all wine shops stocked this way, as that's really the most useful way of thinking about wine, imo. blackjack68 wrote: I was going to mention the Caipirinha. Love a well made one but have had some from a bartender that didn't know what he was doing. Hmm.... the only Central American rum I've ever had is Ron Zacapa. Have to replenish the stores before the weekend, so I'll keep a weather eye open for that Abuelo stuff. tifosi77 wrote: I feel sorry for you folks in PA, what with your State Stores and all, because shops like Total Wines and More, BevMo, Wine Styles, etc are fantastic resources for these kinds of viticultural scavenger hunts. Particularly Wine Styles, as they don't stock their shelves by varietal but rather by style. So you'll see a header that reads "Rich" and there might six or seven different types of wine under it, next to it is "Oaky" and there might six or seven other wines there. I wish all wine shops stocked this way, as that's really the most useful way of thinking about wine, imo. There are actually 6 PA State stores, 1 of which just got built in my town which are actually quite nice and change the ways they stock the shelves. It's been a tremendous help, they even have tasting on the weekends, very nice stores. Luckily my parents have hundreds of bottles in their wine cellar, so it's quite the treat for weekend visits. They are officially wine snobs now and we take full advantage of that.